A specialised surface active cleaning agent/decontaminant, for use on materials which may be corroded, etched, discoloured or weakened by acidic or alkaline cleaning agents. Supplied as a liquid concentrate, for dillution with water. For manual cleaning, or for use in an ultrasonic cleaning bath. Biodegradable*, phosphate-free, non-toxic, non-flammable, non-corrosive and free-rinsing. Pale amber viscous liquid, having faint odour. A mixture of anionic and non-ionic surface active agents, in an aqueous polyhydric alcohol base. 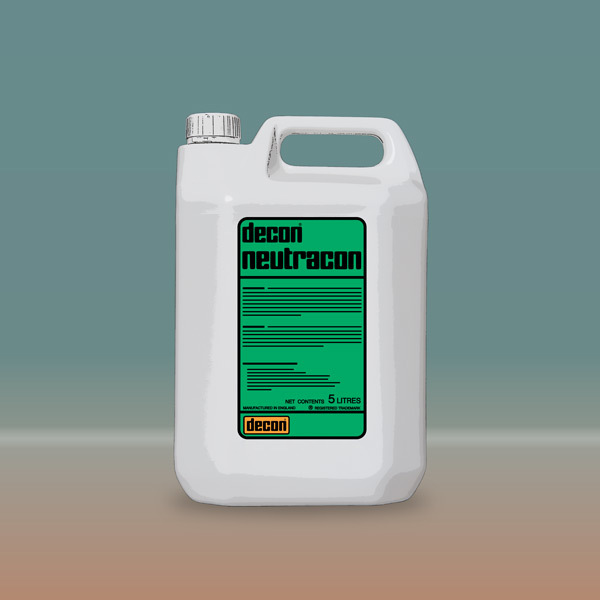 Decon NEUTRACON does NOT contain Phosphates, Enzymes, EDTA/NTA or Chlorine Bleaches. Supplied in 1 litre, 5 litre and 20 litre high density polyethylene containers, with "tamper-evident" screw-on caps. For cleaning and/or decontaminating all non-ferrous metals, such as aluminium, zinc, copper, brass, silver etc., soft glass, coated lenses, polymer surfaces and other sensitive surfaces which must not be cleaned by acidic or alkaline cleaning agents. Prepare a 1% to 3% solution of Neutracon with water†. Fully immerse the items to be cleaned and soak for 2 to 24 hours, depending on the degree and tenacity of the soiling. The cleaned items must be rinsed thoroughly as soon as they are removed from the cleaning solution, and dried. We recommend three agitated rinses in water† to ensure removal of all traces of contaminant and cleaning agent.